Thousands of college sports fans turned out to support their teams at the Atlantic Coast Conference Baseball Championship in Greensboro, North Carolina over the weekend, but it was the athleticism of two spirited canines on the field that had everybody talking. 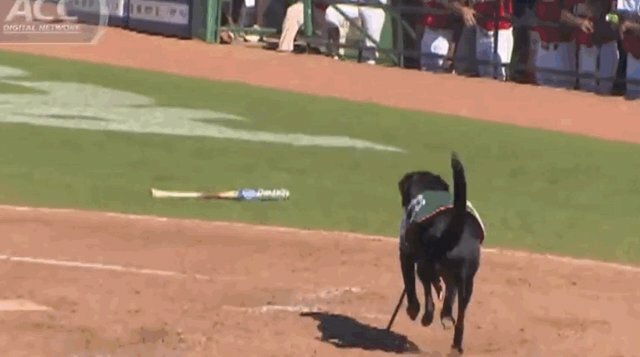 Instead of using the tradition human youngsters to collect players' discarded bats between runs during the tournament, this year the ACC employed the world-class stick-fetching abilities of two bat dogs - a pair of black labs named, appropriately enough, Miss Lou Lou Gehrig and Miss Babe Ruth. The enthusiastic animals were on loan from the city's local minor league team, the Greensboro Grasshoppers, who enlist them regularly to help out during their games. And just like the ballplayers they're there to assist, Miss Gehrig and Miss Ruth are said to undergo months of Spring Training to perfect their bat-grabbing skills.